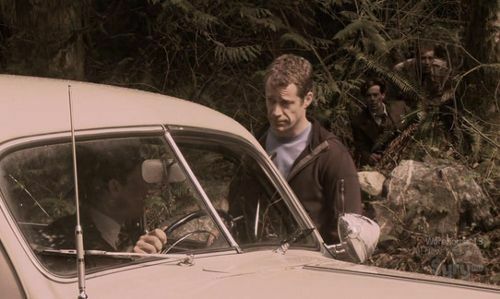 Cultural Wormhole: Eureka - "I'll Be Seeing You"
Past-Grant (James Callis) and past-past-Carter (Colin Ferguson) chat, while past-future-Grant and -Carter watch from the past-and-future-tree-line. The 'Eureka' "mid-season finale" is a doozy, but parts of it felt rushed, like they were trying to pack a two-hour story into a one-hour show. I enjoyed how they developed Grant's role in establishing the "Consortium," and they further explained Barlowe's (both Beverly and her father's) involvement and motivations (and helped explain why Adam Barlowe showed up to torment Grant in the episode "The Ex-Files.") I like the idea that Grant was such an idealist that he set up a secret society of scientists to keep watch over the pace and direction of scientific progress, to keep things like atomic energy from being developed (or at least, to keep them from being weaponized). That Grant and Adam Barlowe were planning to use the bridge device to stop the a-bomb from being developed shows how the violent end of World War II shaped their altruistic motives. All this being said, by the end of the episode, I'm back once again to disliking the direction the Consortium is taking. However, if the Consortium is now more Beverly's game, rather than one in which she's merely a pawn, this difference could potentially serve to make the bland, overdone secret conspiracy arc more engaging. Beverly's wish to help keep her father from court-martial and imprisonment, and Grant's desire to "right a wrong" seemed to make sending Grant back to his own time more acceptable than simply returning him to manipulate the past with knowledge of the future. I enjoy how nonchalantly the writers skip past serious temporal paradoxes, using them when it suits and ignoring them when it doesn't. I couldn't help getting mentally caught up in unraveling the paradoxes myself, even as I watched them sail by unacknowledged. Still, this hasn't been limited to this episode... it's been present in all the time-travel related episodes, at least to some extent. I think it's a testament to the show's purpose—to entertain—that they don't get too bogged down by such things, while resolving them just enough to make the situations understandable. Such disregard for continuity and paradox might not work in other shows, but is forgivable here, especially after the events of this half-season. In what is likely his final episode as a regular cast-member, James Callis' performance was first-rate. Unfortunately, and probably because of that "rushed" feeling to the episode, his character—well, all the characters, honestly—seemed to get short-changed. There were certainly more than a few good scenes, but even the good scenes felt too brief and almost insubstantial, which is a shame since this was generally such a powerful episode. Grant's best scene was probably when Carter told him that his device had killed Allison, Callis' abilities shined in letting us see, almost without words, how completely this knowledge devastated the character. A close second was Jack realized that Grant had taken the jumper cables that Allison was destined to use to revive Adam Barlowe—Grant's remorse was plainly evident, and Jack's own reaction was palpable. Carter probably faired best of all the characters, despite a somewhat bland sequence of scenes back in 1947. He had several meaty and meaningful scenes, but seemed to lose focus (emotionally, not plot-wise) once he and Grant set out in 1947 to get things back in order. Jack and Grant did a lot of skulking around, so maybe it only seemed unfocused because they were trying to stay hidden. Other notable things in the episode involve the fallout from Jo's outburst at the end of "The Ex-Files," and Zane's growing awareness that something is going on with the six time-travelers. Jo and Zane had some good scenes... better, in fact, than some of Jack's unfortunately flat 1947 scenes. I also enjoyed another scene, where Fargo barks out some orders, causing Jack to comment: "Is he getting bossier?" to which Jo replies, "I think I like it." It's a fun little exchange that plays on Jo's preference for strong, confident men, and Fargo's infatuation with her from earlier seasons—you think that perhaps, if Fargo keeps developing this way, Jo might actually be able to see him in a romantic light. Not that I think the writers would go in this direction—I just think it's an interesting little nugget of character, both for Jo and Fargo. Ultimately, it's a decent (if unbelievable and paradoxical) conclusion, with the resolution resting entirely in Jack's hands, despite Grant's honest attempts to help. Basically (and minor SPOILER ALERT here, people) past-present Jack has to trust future-past Jack's recorded message, and get to Allison in time to warn her of her impending doom. I'm a bit concerned, if this is the last time we get to see Grant, that the resolution to his character arc is a bit of a letdown compared to his enormous initial potential. Don't get me wrong, I thoroughly enjoyed the character, and loved having James Callis as a member of the cast for these nine episodes, I just feel like he's proven more of a patsy than a player. They could have taken the character in so many directions, and given him a much more powerful, influential place in Eureka's story, but, in the end (if this is the end), his contributions have accounted for very little (aside, of course, from the massive temporal disturbance). If we're lucky, the last episodes of the season may see his return, in time to help thwart Beverly's machinations, and perhaps renew his leadership of a benevolent Consortium. In fact, if they really played their cards "right," I could see a 'Eureka' spin-off series following the Consortium as they infiltrate important scientific institutions to protect, preserve, and guide science toward more altruistic endeavors. That would be a conspiracy I could get behind, and those seeds have already been planted. I enjoyed this episode immensely: it was powerful and engaging, it had funny moments and dark moments, and it wrapped up Grant's arc in an entertaining, if ultimately somewhat disappointing way. The rushed feeling didn't heighten the tension, but it didn't detract from it too much either (the flat 1947 scenes did enough of that on their own). As a mid-season finale, it was a good wrap-up, but I doubt it was strong enough to keep the less dedicated viewer interested until the second-half of the season in... what, six months? They did, however, preview the special Christmas episode coming in December, so we'll see you back here with a review of that episode once it airs.